"The drummer spot in CIIC has always been a tough position to be in"
Zak Stevens is the former vocalist of the legendary band SAVATAGE. In 2001, he formed CIRCLE II CIRCLE. The band has released seven fantastic albums since then, the most recent of them being the band’s heavist and darkest yet, Reign of Darkness, which was released on October 16th. KNAC.COM: Was there a definite decision to write shorter songs for the new album Reign Of Darkness? STEVENS: No. Actually we never had any discussions about song lengths for the R.O.D. album. We were more focused on just creating some interesting and melodic hooks, twists and turns and for the most part creating cool songs and writing some melodic and memorable vocal parts to, no matter what the tempos were. When you look at a snapshot of the entire album the average song lengths are somewhat shorter than we've done in the past but I think this was more a result of us taking more time with the arrangements and cutting out redundancy where we could and just trying to create some interesting twists and moods within the songs. We approached the writing with a lot of different styles too because we had four and sometimes even five guys in the band writing songs together on this album too. This is the most writers we've ever utilized on a CIIC album so that also may have resulted in song length differences compared to past albums. This was just one of many things we tried in the writing phase of the album to show a different side of the band and to try and show some musical sides of the band we'd never shown before. 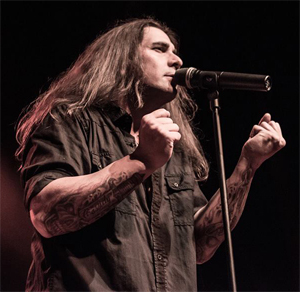 KNAC.COM: Was there a particular event or events that inspired you to write heavier/darker songs for the new album? STEVENS: We actually finished the album in January of this year so we had to wait about nine months from the time it was turned in to the label until the time it was released on October 16th. So events that would have affected the music and lyrical content were taking place midway 2014 to the beginning of 2015. At that time there was of course the huge concern about events taking place in the middle east in Syria and Iraq and all the terrorist actions that were going on against Western journalists and other people in those terrorist organizations. So there was quite a bit of "psychological terror" going through use of the world media by those groups. Those types of things along with the usual political disarray in the US at the time also led to a few more darker themes in the lyrics than I normally pursue. Also some of my favorite TV shows deal with forensics and criminal investigations and the process used to solve horrific crimes. So yeah I would say there were some darker things to write about at the time (laughs). KNAC.COM: Which song is the most important to you on the new album and why? STEVENS: Well I tend to gravitate towards the song "Somewhere" these days. This song has a special meaning for me because it has a positive story that actually comes from something very negative. It's about a person who has endured a sudden tragedy that changes their life forever - such as the loss of a loved one or some other tragic and terrible sudden event. However in the long process of healing from this terrible loss that has left them feeling hollow for so long, the person finds a new purpose and meaning for their life that they would have never discovered if they had not had to go through the trauma of dealing with this loss. I'm actually seeing this sort of thing right now in my own state of South Carolina. So many people have lost everything they owned, and in some cases their own lives, in the recent floods we had here from weather related to Hurricane Joaquin. Hopefully these people here in S.C. who lost so much can find healing and relief soon so they can get on with their lives, but of course they will remember these events for the rest of their lives. KNAC.COM: What caused the change in bringing in new drummer Marcelo Moreira? STEVENS: Actually that change had been going on for a period of years and over at least the last three albums. The drummer spot in CIIC has always been a tough position to be in, mostly due to the fact that I'm a drummer myself and I've actually played the majority of the drums on CIIC's album catalogue through the years. But that's not really what I set out to do, it's just been the most efficient way to get the feel that we were looking for on the earlier albums. Trying to find the drummer who could be the perfect fit for us is practically something I've been doing since the band started in 2003. I totally respect every drummer we've had in our lineups because they've always had a ton of pressure on them for these very reasons. But it comes down to me having the responsibility to find that perfect fit for CIIC. As crazy as it sounds, it took me until now to find him, but Marcelo is finally the guy I've been looking for since we started the band. Of course, finding the perfect fit for any band on any instrument is very difficult and sometimes it just takes a lot of time to find the player that can pay homage to the past music of the band yet open a whole lot of new doors for the future and provide you tons of capability and possibilities. There's no guarantee that you may ever find that player who gives you the perfect fit on any given instrument and that's the nature of the beast that we call the music business. Marcelo gives us a limitless ceiling on what can now do from a percussion perspective when it comes to drum parts and that's what I've been looking for so long to find and we're just so happy to have him with us. Marcelo even plays guitar and multiple instruments that everyone will be able to get a glimpse of when we hit the road with him in early 2016. 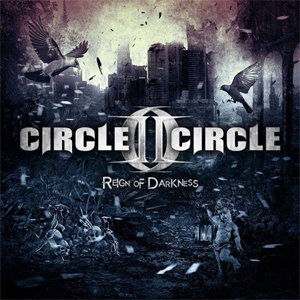 KNAC.COM: Will there be a CIRCLE II CIRCLE US tour of some sort? STEVENS: Yes, we're currently talking to several great bands that have shown a strong interest in putting together a package tour with CIIC for the US in the Spring and Summer of 2016. We have a lot of different countries to play in support of the R.O.D. album and we're very excited to get out there and travel the world in support of the album and see our friends and fans who are some of the most supportive people in the world when it comes to music they love and want to hear live. KNAC.COM: Were you surprised by the overwhelming response of SAVATAGE's Wacken reunion appearance? STEVENS: I wasn't really surprised because SAVATAGE has played Wacken before with the same lineup that just reunited on the W.O.A. stage in 2015 so you never really forget that feeling and you know that you're playing for the most die-hard and passionate music lovers of your genre when you play at Wacken. I knew it could be overwhelming, but first WE needed to have that chip on our shoulder and deliver the best show we could possibly deliver. And I believe we definitely met that goal. Personally, I approached the preparation and the performance of the show as it was the most important show of my entire career. There was no other way I was going to look at it. I'm so proud of all of the guys because they all approached Wacken in the very same manner. When you see that kind of preparation and pride coming from your band mates you want to try even harder. I loved every phase of the entire thing to say the least. And when I saw how much the guys cared and how great they wanted to be, I really felt like the response was going to be equal to the effort we all put into it. KNAC.COM: If SAVATAGE ever tours again, would you be interested in doing the tour? STEVENS: Absolutely. That's no surprise to most people because I've been saying that for many years now. I really hope that we can put something together that will be very special for all of the fantastic fans and supporters of SAVATAGE who have been so great and special to the band for almost three decades now. KNAC.COM: Will SAVATAGE record a new album and will Jon Oliva or Paul O'Neill be involved? STEVENS: I'm not sure exactly what's going to be on the discussion table for all of that as of yet, but of course if there will be a new SAVATAGE album Jon Oliva and Paul O'Neill will definitely be involved. I can't imagine it being any other way. That's the way we do SAVATAGE albums. KNAC.COM: Will you be touring with TRANS-SIBERIAN ORCHESTRA again this year? STEVENS: Yes I'll be one of the lead vocalists for the T.S.O. Winter Tour 2015 in the U.S. I'll be performing in the East Coast company. KNAC.COM: What do you think about Steve Spurrier resigning?